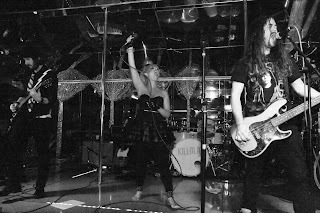 I recently had the opportunity to speak with the excellent folks in Killola, a four piece “Hardpop Altcore” band formed in 2003 and based in Los Angeles. Consisting of Lisa Rieffel (lead vocals), Mike Ball, (guitar), Dan Grody (drums) and Johnny Dunn (bass), the band’s indie work ethic and unique blend of garage rock, punk, and pop/electronica has created a devoted international audience. The band tours regularly in the US and UK and has a strong Internet presence. Killola were early Myspace adopters; they had songs posted on the site in late 2003. They have been consistently on the front edge of digital distribution and marketing, successfully deploying many innovative strategies including free tracks, USB flash-drive bracelets and Dog Tags, and a diverse, synergistic media presence. Lisa Rieffel is also an actress appearing in the upcoming feature film/rock-musical “Girltrash: All Night Long” (all the film’s music by Killola) and an original cast member of The King of Queens. In 2007 Lisa and Johnny began hosting a weekly radio show (on Dave Navarro’s personal Internet Radio Network ‘Spread Radio Live’) featuring a mix of music, interviews, fan interaction, and general mayhem. The band’s first 4-song EP was released for free on stencil-screened CD-Rs packaged in hand painted sleeves. Their first formal record, “Louder, Louder!” was released in January 2006. It was recorded frugally and sold well on both and 7” vinyl, particularly in the UK. They released a live DVD/CD, “Live in Hollywood” in October 2006 and self-booked a UK tour in the summer of 2007. Their second album, “I Am The Messer” was released in April 2008 on CD and USB flash-drive wristbands which also included extra songs, photos, videos, and hidden ‘easter eggs’. The album was made available for free download in August of that year through sponsorships with DW Drums and Skullcandy. The band has self-funded their own videos and has a killer iPhone app. Their website, blog and mobile presence are all seamlessly connected, keeping the engagement with fans strong. Their new album, “Let’s Get Associated” was announced in March 2010 and is available on USB flash-drive Dog Tags which include their entire CD back catalog. Thanks to Wikipedia for parts of this history. You can read the full entry here. Oh… did I mention that their website kills? Tell me a little about your musical background. All 4 of us are all self-taught from a young age. And Dan (drummer) attended the LA Music Academy. We learned songwriting by trial and error, gauging what works through incessant home-demoing – and re-demoing, and rehearsing. We like a brisk pace… for us, Songwriting Faster > Songwriting Slower. Less time to question things. Can you describe what makes Killola’s music and vibe so engaging? That’s probably better answered by fans/listeners…I suppose we try to be personally accessible, and ‘real’…. A lot of bands really try to shine themselves up, in their bios for example, to be angelic or plastic, and that truly comes off holier-than-thou. We tend to reveal ourselves in more realistic light, and show people that we’re just regular folks who just happen to have this outlet for making music in a band. I think that lends to the accessibility. Our fans are unique. Snarky and sharp, and dependable. We do a weekly radio show (Monday nights, www.killola.com/radio), and while the weekly listeners flux and grow… we can always depend on the core-group of listeners to be there, hanging in the chat room, reliably for years now. You’ve been doing innovative DIY marketing since 2003. Your first EP was delivered in hand painted sleeves and you gave away copies. How did that work to for you? I mean, it was rough guerilla distro of a realllly-rough DIY demo… there was no way to precisely track anything. We’d leave stacks of these cool-looking, hand-painted CD packs in various places around LA… we’d often get curious, and come back later that day and the stack would be down to 1 or 2… sometimes gone completely. And the boring-looking CDRs that were there next to our stack would still be there, untouched. That was at least indicative that ours were standing-out from others. And when we had an upcoming show in town, we’d tuck a flyer inside… and sometimes we’d meet a few people at the next show who mentioned the demo they’d picked up that week at Amoeba, or somewhere else. Are giveaways driving fans to your shows and triggering sales? Absolutely. We gave away our last album (digitally) to more than ten thousand people. Within 6 months, our CD inventory was totally depleted from online sales. We toured to cities that we had never played before… and people were there, singing along. I have to assume that’s at least partially due to all the freeleased music. Is the business picture different in England and Europe? Totally different. People buy singles there, physical/tangible singles, in anticipation of an album… and those purchases vault bands into the mainstream. Also, rock music still dominates a large portion of the industry…. and the radio plays a lot of rock music there. Also, newspapers/magazines still trump blogs… and on and on. Its a highly media(magazine/newspaper)-driven industry there. Plus, touring an album through the UK is a piece of cake, compared to the US. The entire UK is about the size of Oregon, so you can loop the entire UK, many many times, in a few weeks. One US tour takes one month, minimum… and that’s a long, hard drive. How often are you touring? We do a west coast/Southwest tour every couple months… a full US tour every 12-18 months. We’ve only done the UK once, however we are needing to get back there again, badly, soon…. I love the USB flash drives. How do your fans like them? Are they making you money? We decided to ‘pre’-release our new/latest album via USB Dog Tags. So, this currently is the only way to get the new record. Obviously, the biggest fans are going to jump on this, in order to get the new music right away. However, I’m certain that CDs are still preferred, because of car stereos, and the nostalgic vibe of the new-CD-process (open, listen while reading liner notes, a defined listening track-order, etc). So, there’s a lot of people asking for the new album on CD. Are the USBs making us money? Oh yes. How important are mobile apps? I don’t know how important they are… but they’re awesome, that’s for sure. The internet is a wide open click-a-thon.. stream of consciousness, and unconfined, distractions abound. Good apps are internet-based, but they keep you ‘focused’ on a task. I love that. Want to browse for pets? Open the PetFinder app. You’re going to see the same pets that you would see on their website… but that’s it. The URL bar isn’t lurking there, temping you to read The Onion… I like having that focus as an option sometimes. How many people do you typically get at shows? Depends on the city, and what day of the week… LA is packed. NY is packed. In-between is a toss-up. Tuesday night in Lincoln, Nebraska… hm… not sure. How big is your mailing list these days? Above 7,000. The only reason I know that is because we recently had to upgrade our mailing-list provider to the next tier in monthly mails-allowed… it costs us more now to send-out one newsletter. Yay? How have you funded the band as you have grown? Basically, if its gonna cost us… we need to learn how to do it. That outlook saved us 90% of the costs that most bands just swallow. Learning exactly what outsourced-services DO gives us more insight into the cogs of this machine… and also makes us keen to what price we WOULD pay, if we were to outsource. We have lots of music in TV and movies… and that’s a fantastic way to raise money for the stuff we wanna do. Your web presence is really strong. How much of your biz is coming from web sales and how much from live gigs? Our online store is pretty deep, so its a steady well. There’s enough variety on there to pretty much please anyone, so I’d say that’s the lion’s share of income… unless we are out on tour. On the road, the gigs pay, and the merch sells at the gigs, so its a self-fueling machine. How much music and merchandise do you typically sell at your shows? I have no idea. We have a dedicated merch guy, and a credit-card machine, and he has a computer there to track it all, so I imagine all that stuff is called-for…. I just try to mention the merch-table from stage one time per show, and we try to hang out there for a while, post-gig. There’s usually a group of people picking stuff out throughout the night… and I know we’re constantly re-ordering new merch, because I design the artwork. So I guess it moves steadily. How have you learned the business side of music? Did you take classes, read books, talk to people in the biz? There’s no better way to learn it than getting out there and doing it. We manage ourselves (something that we are more and more eager to offset), so we’ve dealt with 7 years of business/issues first-hand. We’ve skinned our knees on contracts, and fended for ourselves in negotiations… and we all fairly headstrong in both business, and common sense. If something smells strange, 99% of the time its because it IS strange… don’t be afraid to ask the difficult questions and usually the source of the odor is revealed. We also picked a lot of people’s brains over years of coffee. Who are your partners? Mob Agency handles your bookings… How about personal and business management, attorneys and music publishing? Are you handling the Internet marketing drive yourselves? We work heavily with Aderra (a digital/music technology company), on both strategies and tour-support. And MOB Agency is a fantastic company for booking those tours. We will soon be putting out feelers for a good manager, because we have a full movie coming out next year (a musical, in which Lisa is the lead-role, and Killola wrote all the songs… Lisa and I co-produced). And so far, we are self-published. All marketing has been from within, however we did work with a PR company (Reybee) on this last tour they were great. We will be sticking with them for future press campaigns. How did you vet your partners? How did you know what questions to ask? If you’re friendly to people, they’ll introduce you to their friends, and so on… for years. In 2008, we played the ‘wrap-party’ for a big movie (hint: Nakatomi Plaza part 4)… a guy we met in 2006 (who worked on our video for “I Don’t Know Who”) did special-FX for this movie, and he asked us to play. People from MOB Agency were there, and a few weeks later MOB contacted us for a few shows… we hit it off with them as people, and have worked together since. We didn’t have a TON of questions for MOB, because their work ethic and track-record spoke volumes. Similarly, we met Aderra through a friend of the band, and Killola ended up as the first band Aderra ever recorded live. Aderra now tours with some of the biggest bands in the world, recording live shows. We’ve worked with them since that first show. We want to work with people who 1) we get-along-with as human beings, AND 2) they do good work in the music business…. This industry is saturated with people who are only good with one or the other. How much of the web and app development do you do yourselves? It all feels really well integrated and personal. I’m a web designer by profession, so everything you see out there is all from within the band. The Killola iPhone app was built by an app team, but we designed the graphics/skin so that it rightly matched our existing look. How much time do you spend each day communicating with fans and updating your social media network? We’re mobile as crap. So our iPhone keeps us socially synced throughout the day. All the sites are tied-in together, allowing one single update to propagate throughout our network. But sometimes we just turn everything off for a day or two. That helps with sanity. We stream live video from our phone, to the web, from rehearsal, from the van, from parties… anywhere. It keeps us connected to fans, and keeps it fun. How do you balance practicing/writing/recording, etc. with the business stuff? Usually (when not on tour) we get together once or twice every week or two, just to hang out, and we often do that at our practice space. Music often ensues. Things were super hectic earlier this year, as we shot a full-length feature movie for nearly 3 months. This took us out of our ‘normal’ band mode, and sort of inserted 40 new band members into our life… there was no balance, just two gears: Learning, and Go. How would you chart your growth? In other words, when did things kick in and what was the sequence; gigs, Myspace, YouTube, CDs, website, giveaways? I’d say we were adolescent at the exact time Myspace hit adolescence, in late 2007… our numbers and fanbase popcorned in parallel with that site, and we sort of rode the Myspace mechanism into 2008 with our first full US Tour. Once that site starting losing efficacy, we had already rendezvoused with our fanbase at more intelligent websites, we had tours in place, and were able to convert the web-presence into real-life encounters on tour. In what order did you add partners, and why? MOB (booking) was our first partnership. Good booking is the only situation that is almost entirely shut-off to independent bands. Clever and hard-working independent bands can do ‘almost’ anything that labels can do… however booking agents are still absolutely powerful and necessary. Aderra offered an outlet to technology that no other company offered; we wanted to work with them because it’s a fresh, new medium (live recording distro) and the people behind Aderra are fantastic people and smart cookies. How involved are you in music publishing? Are you making money with synch licenses, and performance royalties? For non-radio-bands, and independent acts, music publishing and synch licenses are the quickest way to BIG checks in this business. Placing one song in a movie or commercial can totally change your entire year/decade. And the pretense factor in music licensing is surprisingly low. Record great songs… movies don’t seem to care what band you’re in, what label you’re on, or what blogs are saying… they tend to buy music that works. Which is refreshing. What are your thoughts on making a living in music? All the successful musicians I know are a highly skilled jugglers, in the professional sense. If you want it bad enough, you can make art/music work without a ‘day job’. I wouldn’t recommend trying it outside of a major metropolitan area… but if you’re smart, and flexible… and humble… it works because there’s always a need for determined artists. Are you interested in moving to an indie or major label? What do you see as the advantages and disadvantages of working with a record label? Certainly. We’ve only gotten to where we are by listening to reason. If a label provides something desirable, then there might be reason to work together. A record label has the built-in power of a catalog. If Label X has a successful back-catalog of great releases…. that label’s ‘newest’ artist is almost immediately granted ‘credit’ based on the past-successes of that label’s catalog. Labels can mean great exposure in the proper scenario. Thanks for sharing all of this great stuff!